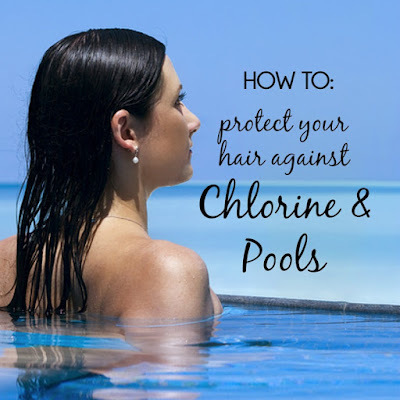 Beauty Blog by Angela Woodward: How do I Protect my Hair Color from Chlorine? As we approach spring I am hearing this asked everywhere more and more! We all know that when you're swimming your hair takes a hit. It starts to feel drier if you swim often, and your color fades quicker. Some people even experience a greenish tint on their hair. So how do we protect our hair from the effects of chlorine when we swim? before you go swimming get your hair very wet. 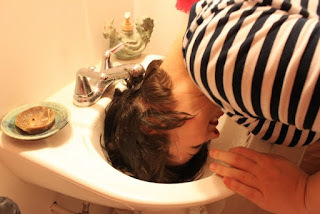 Whether it is by dumping a water bottle of water on your hair poolside, jumping in a shower at the gym in your suit, or even using the facilities restroom to collect water in your hands and saturate your hair as much as possible in the sink, getting your hair wet with tap water (or better yet purified or distilled water) will prevent the negative effects of chlorine. Why does this work? Because when you get your hair wet, the water molecules actually lift the cuticle layer of your hair and enter into the hair strand. If you have the strand saturated with distilled water, then when you jump in the pool the strand is already filled with distilled water and cannot take in anymore, which mean the chlorine will only be able to reach the outside of your hair strands. Now obviously the longer you are in the pool the more time your hair has to slowly allow the chlorinated water to penetrate it, but it takes much longer if you saturate your hair before entering the pool. after saturation you will get best results by putting your hair in a bun or braids. You don't have to use a super fancy deep conditioner, but after saturating your hair as instructed in step one, you can also throw some conditioner on it. Once again this takes up room in the strand so that the chlorine cannot penetrate, however it is stronger than water alone, and will work even better! You do need to combine the conditioner with water. If you put conditioner on dry hair it will not be as effective. No need to break the bank for this conditioner. I like the Sauve Professionals Infusions Macadamia Oil & White Orchid Conditioner. It is not as healthy for your hair as a salon professional brand, and I would never recommend it for regular use, but to use in the pool as a hair filler? Why not! MAKE SURE you wash your hair with a high quality clarifying shampoo and conditioner after! (no co-washes). So you go swimming at the community pool with your friends. After you plan to go grab a burger and watch a movie at a friend's place. That means you will not be home for hours after your swim. Do not be afraid of gym, pool and high school locker showers! Get in there and rinse your hair with a hydrating shampoo and conditioner before toweling off and changing into street clothes. 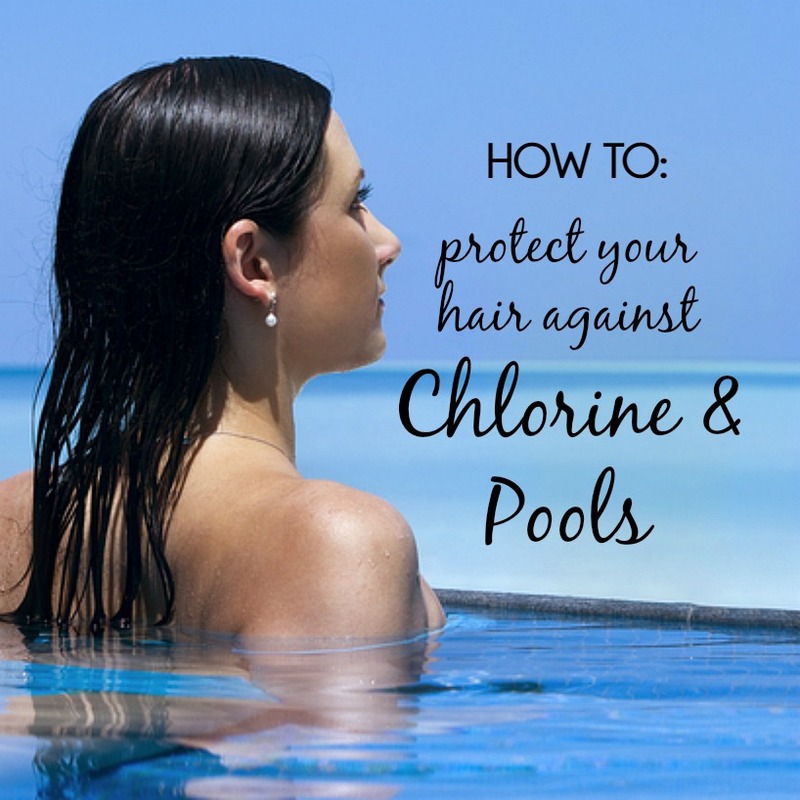 The longer you wait the longer the chlorine has to damage and dry out your hair! Plus if you did step 2, then you will want to remove that buildup of conditioner as well! You NEED to use a clarifying option though. See Step 4 for more on that! Throw a travel option into your (like this one) bag with your towel for easy access. If you swim more than 1 time a week, you may find that even using these steps you still have built up on your scalp. This buildup will feel heavy and like a greasy scalp, usually with dry ends. This is usually a mixture of oils, chlorine, other pool cleansing chemicals, and hair product. Strip it out by using a detox or a heavy clarifying shampoo. The Clarifying Shampoo Three from Paul Mitchell is one of my favorites as well as Detox from Abba! Finish it with a good moisturizing conditioner. Cleansing Conditioners are all the rage right now, but these one steps are not a good idea if you swim more than once every two weeks. This is because these two in one systems gently cleanse while adding a lot of moisture, however they are not strong enough to cleanse the chemicals from the pool. If you get your hair lightened (highlights or any form of blonde-ing) you should avoid the pool for 2 weeks after your appointment (MINIMUM ONE) because your hair is more porous and susceptible to chemical damage. If you hop in the day after your appointment the likelihood that you will have dry and green hair is high. So maybe skip the swim and wade in the shallow end with your hair up, or relax poolside with a book.